Anyone who has tried golfing knows it’s a difficult game to play well. Imagine a blind person trying to master the game. Native-Duluthian Clinton Russell, who lost his sight in his late twenties, not only relearned the game as a blind man but pioneered golf for the sightless. For years he was one of the best blind golfers in the world. Clinton Francis Russell was born in Duluth on October 8, 1895. His father, Newell F. Russell, was born in 1869 on a farm near Rush City, Minnesota, and came to Duluth in 1888. In 1892, Russell partnered with dairyman Henry Bridgeman to form the Bridgeman-Russell Co., Duluth’s first major production dairy. Clinton’s mother was Isabella (Wright) Russell, born in Michigan in 1871. She and Newell were married in Duluth on November 4, 1891. Clinton grew up in a house at 4440 London Road and attended Duluth elementary schools and Central High School. As a boy, his interests included fishing, hunting, rowing, and golf, among other sports. In the fall of 1915, like many of Duluth’s wealthier young men, he went off to the Phillips Academy, a preparatory school for boys in Andover, Massachusetts. In October 1916, he began studying at Syracuse University in Syracuse, New York. His college education was interrupted by World War I. In March 1918 he returned to Duluth and joined the Army Air Corps. His older brother Earl also joined the Air Corps. After the war, Clinton returned to Syracuse and received his degree in 1921. A year earlier he married Ruth Jones, a fellow student at Syracuse, and after graduation they moved to Duluth. The Russells settled into life in Duluth. They purchased a home at 2132 East 5th Street and he worked at various job for Bridgeman-Russell, learning the business. They would have two daughters, Jean, born in 1921, and Phyllis, born in 1923. An accident in 1924 would change Russell’s life. On his way back to Duluth from a hunting trip, Russell’s car had a flat. As he was changing the tire, it blew up in his face, blinding him. After a few years he returned to work at Bridgeman-Russell, becoming treasurer of the company in 1929. Later, on a trip to California, he was walking a golf course with his father and brother and they urged him to take a swing. He did, and it renewed his interest in the game. Returning to Duluth, Russell began practicing at Duluth’s Ridgeview Country Club. He took lessons from the pro, Sammy Belfore, and developed a system using a friend or caddy to tee up the ball, adjust his stance for direction, and line up the club face. In 1931 at Ridgeview he shot an 84 for 18 holes, an accomplishment that was publicized in the media. Researchers for Ripley’s Believe It or Not picked up the story and ran it as their daily newspaper cartoon. It appeared in the Duluth Herald on June 29, 1932. Russell continued to practice his golfing system. 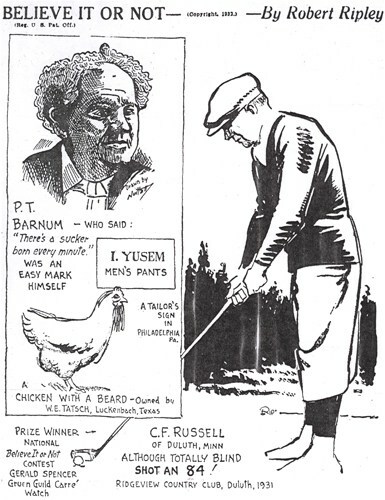 In 1936, Russell learned of another blind golfer when Ripley’s ran a cartoon showing Dr. W. H. J. Oxenham of England, who “frequently plays under 85 gross,” as Ripley’s proclaimed. Oxenham had been blinded in World War I and had not golfed before losing his sight. He started playing the game around 1931 using a system similar to Russell’s. Probably sensing some valuable publicity, Robert Ripley offered to sponsor a match between Russell and Oxenham. Ripley said the winner would be the champion blind golfer of the world. The match began on Ridgeview’s first tee at 2:00 p.m. The round was contested in match play, in which the winner of each hole is awarded a point, and the most points wins the round (as opposed to stroke play, in which the lowest total score wins the round). Both players used caddies to assist with lining up shots and choosing clubs. Russell used his regular caddy, Jimmy Koehler, a fine golfer himself. A crowd of 3,000 people following the match at the start, and newspapers reported that the gallery increased throughout the afternoon, with some estimates as high as 10,000 onlookers. Each golfer topped his first drive, which was attributed to nervousness, but as the match progressed they both relaxed and hit some good shots. Russell gained an early lead on the hilly layout by making some key putts. Both players parred the par-3 tenth hole. The steadier player that day, Russell won seven holes and lost only one—the fourth, a par 4. In 1935, Russell became vice president of the Bridgeman-Russell Co., and in January 1940—following the resignation of H. O. Ahl—the company’s board of directors elected him president and general manager with, a position Russell would hold for four years. Russell’s next “blind-vs.-blind” golf match came in 1941 against Marvin Shannon, a blind golfer from Fort Worth, Texas, who had just taken up golf three years earlier. They played an 18-hole match at Duluth’s Northland Country Club on August 24. Russell won 2-up, sinking a ten-foot put on the 18th hole to clinch the win. Shannon won a rematch in Fort Worth on October 26, 1941, up 8 holes on Russell with seven left to play. Russell retired from the presidency of Bridgeman-Russell in October of 1944 but stayed on as chairman of the board. Blind golf events weren’t held during World War II but started up again after the conflict ended. In 1946 in Inglewood, California, Russell won the National Blind Golf Championship, which had a total of four participants and was sponsored by Bob Hope and Bing Crosby. 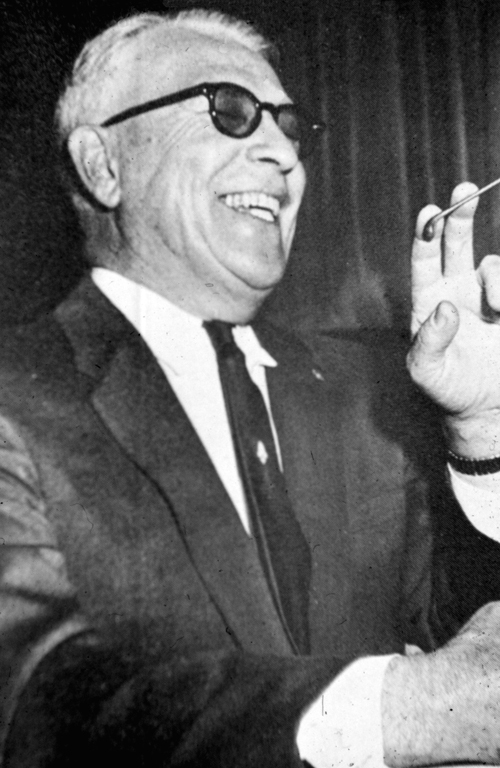 The second-place finisher was Charles Boswell, who was blinded in World War II. Six golfers took part in the championship in July of 1947 at Northland Country Club in Duluth. This time, Charles Boswell defeated Russell by one hole in the final match on July 27. Boswell would go on to win many championships. Russell won the championship again in 1948 when it returned to Inglewood, California. Two months later, Russell faced Dr. Oxenham again in the International Invitational Golf Tournament for the Blind at the Rackham Country Club in Detroit, Michigan. In the 54-hole stroke play event, Russell beat Oxenham with rounds of 133, 127, and 125 for a total of 385, seven better than Oxenham’s second-place 392. Russell would repeat his win in the same event the following year. The United States Blind Golf Association was formed in 1953 and Clinton Russell was given much credit for its formation as well as for being the first blind American to learn how to play golf and encouraging other sightless people to start the game. In January of 1957, Russell traveled to New York City to receive the 1956 Ben Hogan Award from the Metropolitan Golf Writers Association. The award was presented annually to the golfer who has made the greatest comeback from illness or injury. Previous winners of the award included President Eisenhower and Babe Zaharias. Russell said it was the biggest thrill of his life. Golfers Sam Snead and Bob Jones spoke at the event. Russell died in Duluth on September 24, 1961, at the age of 65. In 1975, he was enshrined in the Duluth Arena Sports Hall of Fame.